An adventure, survival and exploration in an infinite procedurally generated universe. Using your spacecraft, you'll be exploring new planets, and discover new lifeforms, which all of those sightings you'll be able to submit to a universal shared online database. Upgrade and buy new ships and obtain new tools that will assist you in your voyage to the center of the galaxy. The game features space battles and unparalleled heterogeneous diversity of organic lifeforms. No Nam's Sky is one of the most ambitious games we've seen in the video game industry for quite sometime.It seems that many people had a hard time grasping what this game is all about. There are still many questions left without answers. But the closer we get to its release, more information is revealed about it, and the more people get excited about it. What type of game is No Man's Sky? 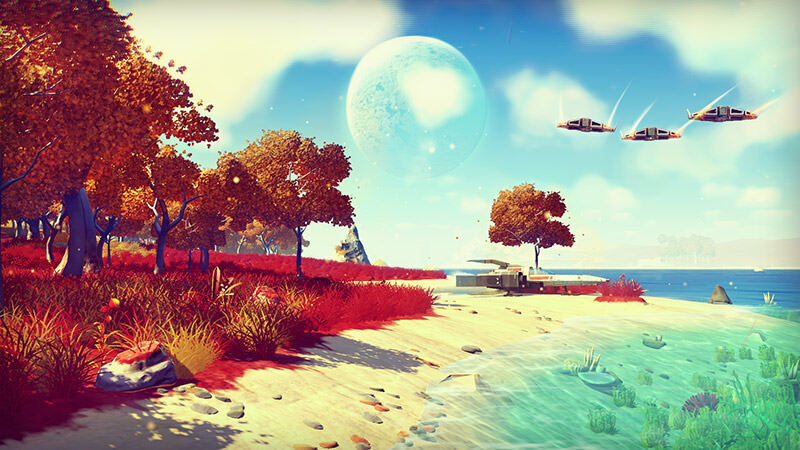 No Man's Sky is at its core an exploration adventure game. One of its most awe-inspiring features is that ever element in the game, whether a star, a creature, a plant, weapon or ship - all is procedurally generated. This means that even the developers themselves haven't got a clue what they are going to see when they land on a random planet. So how many start No Man's Sky universe has? - Well, there can be like over 18 quintillions (quintillion = 1 with 18 zeroes) stars in No Man's Sky universe (2 powered by 64). So it apparently means that you won't be able to explore them all, but this is not the goal clearly. According to its developers, you missions is to reach the center of the galaxy. Whatever waits you there is still a mystery. In No Man's Sky, you'll be flying in a Starcraft and start investigating nearby planets and even its moons. You do so to discover new lifeforms and plants. Once you descend on the surface of a planet, you can move and walk out of your ship. Every discovery you make can and encouraged to be uploaded via a station. This station exists on each planet and will log and send your findings to a universal database. Like a galactic encyclopedia where all the discovering of all players are being logged. You can give a name to each of your discoveries - cool! No Man's Sky features beautiful visuals. It's not on the realistic side, but rather on the cartoonish side, but it looks sumptuous. Each planet has its own unique biological and chemical composition, which is used by the procedural engine to form its entire ecosystem. 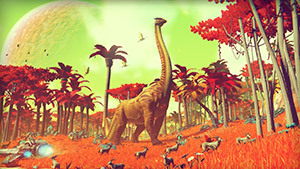 You can land on a planet with an ocherous landscape, big oceans and with dinosaur-like creatures, and on other planets you'll see little creatures, lush green fields of tall grass and very tall red trees. Each planet tells a story of its evolution, and I'm intrigued by the fact that in very high probability, I'll be the first person to ever been on many of those planets. If you are the first to visit the planet, you have the option to name it. So if someone else visits the same planet, he'll see that you discovered it. No Man's Sky does have weapons, and even those are procedurally generated. You'll me using those to survival in sometimes very hostile environments. You can kill creatures, even those that do no harm to you, but beware, there are sentinels on each planet. If you start doing considerably large damage, they will go after you and try to stop you. You'll also be fighting against other enemy spaceships. There are different types of enemy ships. You might find yourself in a space conflict against a big ship with small ships that are continuously trying to repair it, so you'll need to kill those first. The space combat system is pretty simplistic, so you don't need to be a very skilled pilot to survive an attack - but it still very satisfying. You also have in-game currency, which you can use to acquire new weapons, ships, and upgrades. There are hundreds of thousands of variety of ships and arms in No Man's Sky. This is something that is hard to grasp. But as I stated, they didn't require to model each one, it's all randomly generated. For each discovery you'll you'll earn more money, which you can later use to buy new loadouts that will help you through your cosmic journey through space. If you die in space, you will have to use your escape pod to land on the nearest planet. From that point on you'll need to start gathering resources to buy a new ship. If you die on foot while on a planet, you'll use all the resources you've collected, and you'll spawn near your spaceship. The game will be released on both PC/Windows and PlayStation 4 with native support for Project Morpheus HMD. Sony is a great supporter of this game, and I won't be surprised if No Man's Sky will be released first with exclusive Project Morpheus support and later on it will support Oculus Rift VR headset. There are also rumors about the game being Sony's launch game. Rumors aside, this game will be amazing in virtual reality. Just imagine being able being in space, surrounded by billions of stars, each one you can land on and explore. NMS is one of the most highly anticipated games in 2015, but apparently it will be released in 2016, mainly because Project Morpheus is planned to be released in 2016.